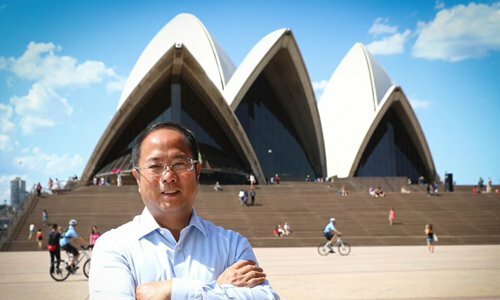 Editor's Note: Chinese property tycoon Huang Xiangmo's permanent residency in Australia was canceled by Australian officials, newspaper reports said last week. In an exclusive Chinese-language interview with Global Times reporter Fan Lingzhi(GT), Huang said the accusations were "prejudiced and groundless" and the cancellation has had a huge impact on his business and his family. GT: Were you instantly informed when you were denied your Australian permanent residency? What were you doing then? How does it affect you and your business? Huang: I got the information after my lawyer in Australia received a notice from Australia's Department of Home Affairs. I was at my house in Hong Kong and I went to Thailand frequently for my new investment there. I moved from Hong Kong to Australia seven years ago and I traveled between the two places frequently to take care of my business. Like many Hong Kong businesspeople in Australia, I am always "up in the air." The incident has had a huge impact on me and my family. Three generations of my family have lived in Australia for seven years. Apart from me, all those in the family are Australian citizens. The younger generation have studied, worked, married and had children there and just like other Chinese people in Australia, they have already been fully integrated. Australia is their home. More importantly, my granddaughter was born in Australia and she is learning to speak. She is now at an adorable age and I think about her frequently. It also affects my business of course. Some partners without information on this may have some unnecessary worries and that is why I released a statement on February 8. Relevant documents from the Australian Security Intelligence Organisation (ASIO) clearly stated that I did not violate any laws in Australia. However, those reporters who claimed to have inside information from ASIO mentioned nothing about it. I have to tell my friends and the public about it. A more rational conclusion based on common sense would be: If I did break the law, ASIO would not have to resort to an excuse that is vague and groundless. My business was affected less than my life. First, the business in Australia is only part of our global investment and my family is enhancing investment around the world. Second, my son has taken over the business in Australia since the second half of last year. I made a succession plan for my Australian company a long time ago and it was implemented as scheduled. My son Jimmy Huang took over as chairman last year. I was no longer a shareholder or executive. I hold no positions or shares of the company. It has always been my philosophy that if you decide to hand over a business, you have to give all of it so that the young people have every opportunity to thrive and I can fully focus on the strategic development of our global businesses. As a local enterprise, Yuhu Group Australia has made a huge investment in real estate, agriculture and fisheries. It has brought much employment and is a demonstration of how local Australian companies with Chinese heritage can contribute to the country. The core management team of Yuhu consists of young people born after the 1980s and they are assisting the chairman, who was born in the 1990s, in the company. That's how a young and energetic enterprise should be and I believe they offer to the world a glimpse of a new generation of China-born entrepreneurs. GT: The Australian side denied your citizenship "on character grounds." Australia's Department of Home Affairs seems to have concerns about the "reliability" of your answers given during naturalization interviews and also your communication with ASIO. How do you understand the vague expression of "on character grounds" and "reliability?" Huang: ASIO has never provided any clear statement. The wording in the documents sent to me have been vague. Neither I nor my lawyer understood what they mean and we don't have the chance to cross-examine them. There are only two reasons that are comparatively clearly stated. First, I was previously the chairman of the Australian Council for the Promotion of the Peaceful Reunification of China (ACPPRC) and I am currently chairman of the Oceanic Alliance of Promotion of the Peaceful Reunification of China (OAPPRC). Second, I have business and family ties in China. The two reasons are very ridiculous, as I have mentioned in my statement. GT: You have mentioned in your statement that according to ASIO, the key allegation is that you are committed to promoting the peaceful reunification of China as the current chairman of the OAPPRC and previous chairman of ACPPRC. What do you think is the logic of the Australian side and how do you respond? What have you done in promoting the reunification? Huang: I cannot figure out the logic of ASIO in regard to my efforts in promoting the reunification of China as threatening the national security of Australia. After all, my words and actions are fully in accordance with Australia's foreign policies and laws. I previously thought that any country's intelligence agency, no matter how special it is, cannot go beyond the country's government nor should it act against the country's foreign policies in such an open manner. Australia established diplomatic relations with China in 1972 and has clearly stated a firm adherence to the one-China principle. Australia also has clear knowledge of the two countries' differences in political systems. If someone from the ASIO disagrees with Australia's foreign policy, I believe there's ample room for discussion and negotiation within the framework of Australia's political system. However, it certainly should not be an act from a system that has claimed to have democracy and rule of law to abuse power and force its dissidence on vulnerable Chinese. If you treat Chinese in such a manner today, you would do this to the Jews and Arabs tomorrow and that's the most dangerous thing. GT: Sources reportedly said the decision to deny your citizenship and residency were made after two years' "background analysis" on you by Australia's security intelligence and immigration authorities. Are you aware of such a background analysis of you and is it suspected of infringing privacy? Huang: I have always thought that there would be a background analysis for all who apply for citizenship or residency. It's probably a common practice for any security authority in any country. No information should be leaked during the process, as required by law and to protect the privacy of the people involved. If that is not the case and the authorities leak the information to the media now, they could leak such information to a foreign government in the future. I believe such behavior certainly violates laws and regulations and even constitutes a crime. During the past years, some media have smeared me by claiming that they had inside information from the ASIO. However, on social media platforms such as Twitter, many Australians have questioned those reporters' access to inside information from ASIO, saying the unknown accessibility could be the biggest security concern. If the ASIO really cares about Australia's national security, it should have a thorough investigation about the sources of the media and investigate whether some of the reporters are suspected of serving foreign intelligence agencies apart from their actions of stealing classified information to gain attention and a spotlight. GT: For a long time, the Australian side has shown skepticism about your political donations. We understand the donations were requested by Australian's political parties and what was your major consideration when you agreed to donate? Huang: Since 2012, I offered political donations as asked for by Australia's political parties and politicians. But the so-called skepticisms did not start until 2016. What surprises me is that some media, which are competing fiercely with each other, are surprisingly on the same page. The collaboration is between print media and television, as well as between state media and media from the private sector. Together with echoing from some so-called think tank scholars, the situation is quite unusual. According to reports from independent media, not a few of those think tanks are connected with arms companies from a great power. First, those media do not necessarily represent the whole Australian media sector, and some articles from certain media do not necessarily represent the stance of all the reporters and editors working for the media. There are articles questioning such stories from time to time and I still firmly believe that most of the journalists and editors in Australia have a good work ethic and the capability to get the facts straight. Second, some reports might have created some noises and misled some people. But they could not represent the whole of public opinion and those who are keeping silent in their opinions. Some polls conducted by some think tanks also prove this. As for my consideration for agreeing to donate, I admit it partly comes from the Chinese habit of treating other people in a nice manner and not accustomed to saying "no." But more importantly, I hope to promote Chinese people's legal involvement in politics. GT: Do you think the incident is merely an accident? Do other Chinese people in Australia face the same risk? Are there any such worries coming from your friends who are doing business in Australia? Huang: It was quite unexpected for me. The two-year investigation of me also proved my innocence: They dug deep but found my words and deeds do not violate any Australian laws. What I did not expect is that a system that boasts democracy and rule of law would allow some people from its intelligence agency to punish a permanent resident with groundless accusations and provoke the country's foreign policy and international commitment in an open manner despite the fact that the resident has done nothing wrong. The same risk will certainly fall on every Chinese, or anyone with other ethnic origins. When authorities can still get their way after exhausting every means and finding no evidence to prove their allegations, you can ask the question that if you do have some problem, no matter whether it is big or small, wouldn't that just supply a pretext for them to make an issue out of it? There's a Chinese proverb that says "you can always find excuses if you want to punish someone." Overseas Chinese are quite a diverse group. They have diverse political ideas. There are different perceptions over the incident and on me. I understand this and I respect it. What should be noted is that, if words and acts that are in strict accordance with Australia's laws and foreign policy get punished, are there any standards of punishment? Who will decide the discretion of law enforcement? Who could be safe in such a situation? The risks are not just faced by Chinese but also other ethnic groups. The attacks and heckling focus on my closeness to China, but after all, China has a diplomatic relationship with Australia. It is the top trade partner, not a belligerent or hostile country to Australia. My closeness with China is in accordance with law, reasonable and rational, and has no difference with other ethnic groups' closeness to their home country. If Chinese are to be punished for their closeness with China, people from other ethnic groups could also be punished for their closeness with their own home country. Some Chinese might think the ASIO's anti-Communist needs are behind my case and it seems like as long as you are not involved or close to any "redness" you will be safe. However, how does supporting reunification relate to the color of one's political view? Since you are a Chinese, how could you defend yourself when other people are trying to get you "red?" The Australian government could establish diplomatic ties with the "Red China" and there are no anti-Communist legal articles or articles that set limitations against Communism, so closeness to a Communist party is never a mistake, nor a crime. Why should it be tolerated when some intelligence officer creates his own legal cause? I am a businessman with no interest in political ideology. But I am also a Chinese who loves his ethnicity, his home country and also his new home where his offspring will live in the future. I hope to do my best to make Chinese better engaged with their new home and to construct a new home together with other ethnicities. That's the fundamental reason I encourage Chinese to be engaged in politics and why I do so myself. I have mentioned this more than once in my published articles and speeches, but some institutions and media turn a blind eye to this. They are selectively deaf and selectively choose to misread and misinterpret. So-called anti-Communism is merely an excuse to of their anti-China agenda. GT: How is the mainstream public opinion in Australia? Can you estimate how many support you? For a long time, the Australian media have been surprisingly united in smearing the image of Chinese people and hyping the "China threat." Why is this happening and can you reiterate your response to the attacks on you? Huang: As I mentioned earlier, some reports and certain media cannot represent mainstream public opinion in Australia. Since 2015, the show of some Australian media smearing Chinese has occurred for Season Six, and the current situation is the sixth season of the show. However, what is gratifying to me is that there are still a few articles that have refuted such smearing reports and issued a rational voice. Many friends from political, business and academic backgrounds have sent me greetings and sympathy. Therefore, I firmly believe, and I also hope that Chinese compatriots, especially the Chinese media, will also recognize clearly that the mainstream of Australian society, including the Australian media, could not be represented by some reports or reporters. It's just we cannot be the "silent people" anymore and we should speak out, to let the world see Australia's real public opinion, and avoid the country's return to the White Australia policy and far-right populism. GT: What role have Chinese played in Australia's politics, economics and society in the past 200 years? Some people say that this is a watershed incident in Australia's perception of Chinese influence. Is it so serious? Huang: Chinese have come to Australia for at least 200 years. In 1818, Mai Shiying from Guangdong Province disembarked at Port Jackson and became one of the earliest recorded Chinese immigrants to Australia. The Chinese are some of the earliest builders of Australia. They live in harmony with the aborigines and worked with other ethnic groups from all over the world and have made a great contribution to building a prosperous, rich and harmonious Australia. In the 2016 demographics, the number of Chinese Australians exceeded 1.2 million, accounting for more than 5 percent of the total population. Last year, more than 2,000 people from all walks of life in Australia and nearly 300 Chinese groups gathered in Sydney to commemorate the 200th anniversary of Chinese coming to Australia. Australia's prime minister, federal opposition leader and the governors of the states respectively sent a congratulatory letter to the commemorative meeting, embodying the closeness of Australian society in the form of a family portrait. I was honored to be the chairman of the conference. The response from all walks of life in Australia was very positive. The New South Wales Legislative Council also unanimously passed a motion to highly affirm the contribution of the Chinese to Australia for 200 years and highly appreciated the conference. However, despite the hard work and gentle nature of the Chinese, they still suffered persecution under the White Australia Policy along with other non-European ethnic groups. This has become a stain that cannot be ignored in Australia's great history. Even in the shadow of the White Australia Policy, the few Chinese left behind have made tremendous contributions and even sacrifices for Australia. For example, in the arduous anti-fascist war, the Chinese, along with other Australian compatriots from other ethnicities, devoted their lives and dedicated everything to defending Australia. The official implementation of the Racial Discrimination Act 1975 proclaimed that all Australians, regardless of color or ethnicity, enjoyed the same basic rights and opportunities and declared an end to the White Australia Policy. This law, along with the Constitution, has become the foundation of contemporary Australia. For more than 40 years since the implementation of the act, Australia has become a home for multiculturalism and ethnic harmony through the joint efforts of ethnic groups including Chinese. However, in recent years, there have been some noises in Australia, and racism and populism have shown signs of rising. As for my incident, I think it still takes time to observe and it's too early to say whether it will become a watershed incident. After all, the relevant legal procedures, although long, are still in progress. I still believe in law and justice. GT: Some media say you are the victim of party political competition. Do you agree? Huang: Although I am familiar with many Australian politicians, I am only a donor, a person outside the threshold, who is not interested in the gaming inside or between political parties. My donations were made at the request of political parties and politicians. They raised donations according to the law. I donated according to the law. Except for a parliament member who suddenly returned money after accepting donations for a long time, all my political donations were calmly accepted by them. This also shows that they have enough confidence in the legitimacy of these donations. Otherwise they should have been refunded. I am still very pleased with this. Therefore, to be honest, I simply don't know whether I am a victim of party struggle. This should be analyzed and interpreted by experts who have a deeper understanding of Australian politics and revealed over time. However, I estimate that behind some media's bizarre collaborative reports and bold claims of obtaining intelligence secrets that should not be obtained, there seems to be some strange power operating in a dark place outside the law. It will take time to gradually reveal the secret. I am confident that some organizations in Australia will need to apologize to me when the day of truth comes. GT: What do you think is the root cause of stumbling China-Australian relations in recent years? After living in Australia for a long time, how do you think China-Australia relations could break through barriers and get on the right track? Huang: I am not an expert in international relations, but I have lived in Australia for many years and I have some rough ideas about it. China-Australia relations have always stumbled over the years. I think the root cause is that in a new era of international relations, Australia has not found a position that best meets Australia's national interest. My family and I moved from Hong Kong to Australia not only because we like the beautiful scenery and simple folk customs, but also because it is a home that has integrated the Chinese blood. In the past seven years, I have made many friends of different ethnicities here. The people here are very friendly and kind. The anti-China group is only a very small handful of people.